This step involves syncing the required Learner records from Wisenet to Xero. You can identify a Xero Contact that has been generated by Wisenet by finding the Learner RefInternal number against the Learner. If you do not see this number then it is the old Xero Contact record. 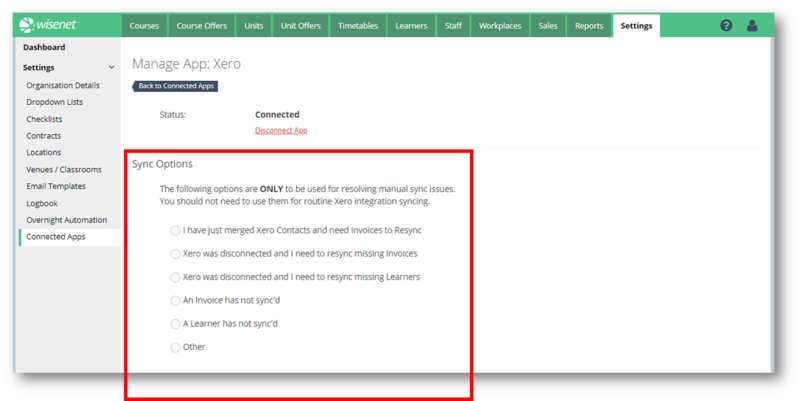 This process will create a new duplicate Xero Contact record if the Learner already existed in Xero. This is required so that you can then merge contacts and keep the Wisenet generated Xero Contact. There are a number of ways to Sync a Learner to Wisenet. 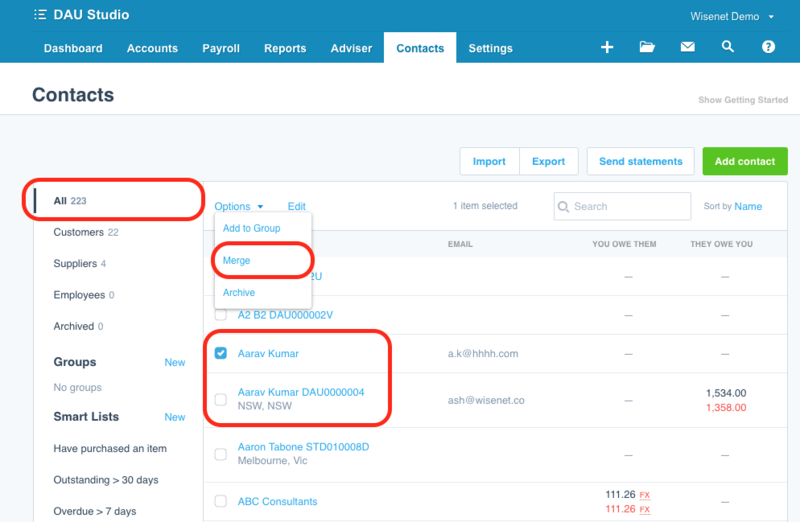 Once the Wisenet generated Xero Contacts are created you can then use the Xero Merge Contact process which will move the Invoice and other Financial details to the correct Xero Contact record. You should now have one record remaining that is the Wisenet contact. If you merge a Learner in Wisenet it will change the name in Xero to have the new “Merged” name. You will need to ensure that the correct Wisenet record is in Xero and then also merge the records there keeping to correct Wisenet record. You may then need to resync Invoices. NOTE: The only impact this may have is that the ‘ContactName’ is generally the default field used on Xero Invoices. Therefore to avoid having the ‘RefInternal’ field on the invoice you need to create (or modify) a custom invoice template to use the fields ‘ContactFirstName’ ‘ContactLastName’ instead of ‘ContactName’. Note: If this is the first time you are syncing invoices or connecting Wisenet to Xero please choose a date range 1 year prior to your Xero account. Here is a snapshot of the fields in Xero and what fields are populated from Wisenet.